Last year, an estimated 1.66 billion people worldwide purchased goods online. With the market size continuing to rapidly expand, online shopping experiences are certainly becoming less personalized and more automated. Although automation improves efficiency, customers are still expecting personal, one-on-one support during their online shopping experience. Offering Live Customer Engagement provides the closest experience to in-person service, but there are a handful of ways to take your online customer support a step further. 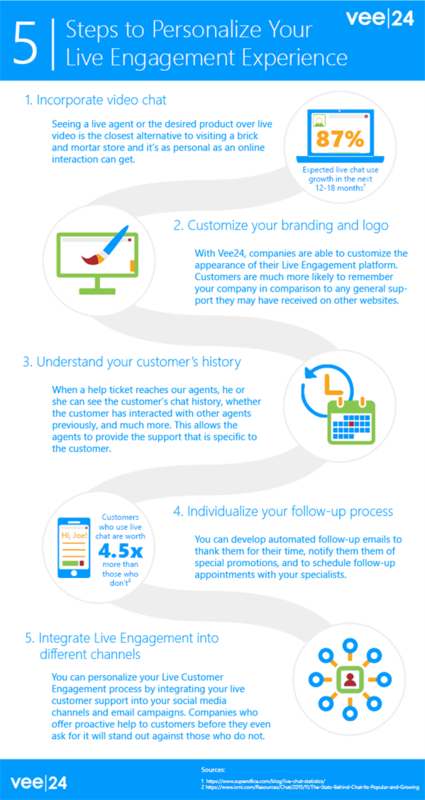 Vee24’s platform allows businesses to not only personalize their own online support system, but also their hundreds of daily interactions with customers. Here are five ways you can personalize your Live Engagement experience for the billions of online customers out there. 1. Incorporate video chat: Offering live text chat services to online customers has become increasingly popular over the last few years. In fact, it is expected to grow as much as 87% percent in the next 12-18 months. It’s no surprise that live chat is the leading digital content method and that more than half of all consumers prefer to chat with someone in real-time for support. However, for an even more personalized experience, Vee24 allows customers to upgrade their text chats to video chats. Seeing a live agent or the desired product over live video is the closest alternative to visiting a brick and mortar store and it’s as personal as an online interaction can get. 2. Customize your branding and logo: With Vee24, companies are able to customize the appearance of their Live Engagement platform. Specific company logos and color palettes can be used throughout the engagement panels, text or video chat boxes, and the “Live Help” tabs that are offered on your website. While your branding stays consistent throughout your engagements, customers are much more likely to remember your company in comparison to any general support they may have received on other websites. 3. Understand your customers’ history: Ideally, businesses should know each and every one of their customers personally, such as their order history and general contact information, in order to provide the most personalized and efficient support. However, it’s highly unlikely that large businesses can retain this type of information for thousands of customers, and also have it readily available when the person reaches out for support. With the Vee24 Live Engagement Platform, this is possible. When a help ticket reaches an agent’s desk, whether that is through text or video chat, he or she can see the customer’s chat history, whether the customer has interacted with other agents previously, which country the customer is in, and much more. This allows the agents to provide support that is specific to the customer without them needing to repeat back information and answer general questions. 4. Individualize your follow-up process: Although the actual engagement with your customer can dictate how they will perceive your brand and your level of customer service, your post-engagement behavior can be just as impactful. Depending on the customer and your interaction, you can develop automated follow-up emails to thank them for their time, notify them them of sales or special promotions, and also provide a link to schedule follow-up appointments with your specialists. When customers receive messages from a company that appear to be specific to their interests or relevant to their previous purchases, it makes them feel valued and helps to develop a more personalized relationship between the customer and the company. 5. Integrate Live Engagement into different channels: In addition to offering live help on your website, you can personalize your Live Customer Engagement process by integrating your live customer support into your social media channels and email campaigns. Companies who offer proactive help to customers before they even ask for it will stand out against those who do not. Vee24’s platform allows you to customize your engagement process by picking and choosing how your will offer proactive help to your customers and on which channels. As live customer support continues to grow, it’s imperative that businesses are choosing platforms that have the capacity to be customized and tailored to their specific needs and are also able to provide the consumer with the most personalized customer support experience possible. Vee24 enables businesses to personalize their Live Engagement services with customized branding and to choose how and where their live support will be offered. It also allows customers to feel that they are having personalized and meaningful interactions when they have the option to interact face-to-face with agents who know their history with the company.